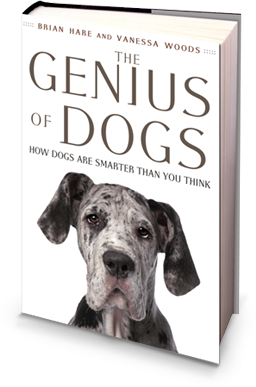 The Genius of Dogs is more than a glimpse into the fascinating world of dogs everywhere — it’s the gateway to unlocking the surprising abilities of your own four-legged friend. Co-author Dr. Brian Hare has used the scientific methods found in his book to create The Dognition Experience, a revolutionary tool that reveals your dog’s unique way of thinking. After completing a personality assessment and a series of science-based games, you’ll discover your dog’s Dognition Profile. This profile will not only detail your dog’s personal cognitive style — it will provide the insight you need to continue helping your dog thrive for years to come. With monthly assessments, trainer-approved activities and a host of other benefits, the Dognition Experience can take your relationship with your best friend to new levels. Ready to get started?